Heads up! Make sure Grimlock for WooCommerce Subscriptions is installed first! Please make sure you have WooCommerce Subscriptions, Grimlock for WooCommerce and Grimlock for WooCommerce Subscriptions installed and activated before creating the pricing page. If you haven’t already done so, you still can install this plugin before proceeding to the following steps. If you have visited our Gwangi demos, you might be interested in creating the pricing page. The following steps will walk you through. We use WooCommerce Subscriptions in our demo websites to mimic subscription-based websites. With WooCommerce Subscriptions, you can create and manage products with recurring payments — payments that will give you residual revenue you can track and count on. However, this plugin is not mandatory for your theme to work properly. Consequently, it is not bundled with Gwangi and has to be bought separately. If you wish to use WooCommerce Subscriptions and our pricing table widget, we recommend that you also download Grimlock for WooCommerce Subscriptions. And if you haven’t installed it already, please also download Grimlock for WooCommerce. They’re both available for free on our servers. Finally, just install and activate these plugins. 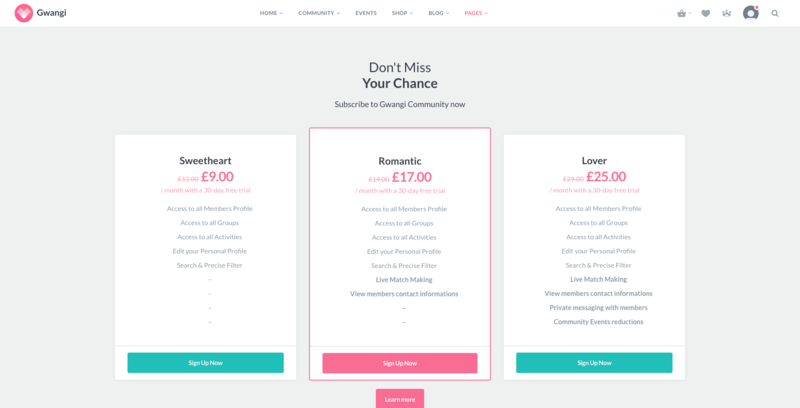 Subscriptions lets you create simple subscription products, much like WooCommerce does for normal products. Much of the product creation is familiar if you’ve used WooCommerce before. We also advise you to regroup all subscription plans in the same product category, as it will help you to make a more precise query on your database with our widget. The pricing tables are dynamically created with a section widget from Grimlock for WooCommerce Subscriptions. You can add the widget to your homepage or any widgetized page. Finally, feel free to add other section widgets to your page to showcase marketing content and suggest the most subscriptions from your visitors.